Since 2006, the Global Gender Gap Report has served as a benchmark for different stakeholders to track a country’s standing in gender parity over time—whether relative to other countries or to themselves. As we consider 10 years of data, it is possible to assess the speed of progress and understand more about the nature of the changes underway. The aggregate figures allow for an estimate of the state of gender parity across the world as a whole. In 2006, the Index showed that the world had closed 64% of the gender gap. In the past 10 years, the gap has closed by a further 4%. There is variation across regions, with some moving ahead faster than others, but no region has managed to change its overall placement since 2006. The Latin America and the Caribbean region, which closed its gap by over 4% in the past 10 years, has made the most progress. 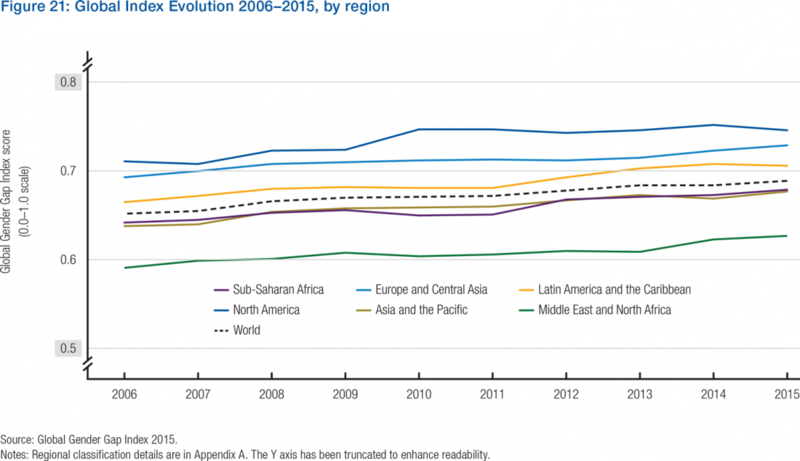 Asia and the Pacific is next, but started with a wider gap. Sub-Saharan Africa, Europe and Central Asia, and North America follow next, having closed 3.7%, 3.6% and 3.5% of their gaps, respectively. The Middle East and North Africa region has made the least progress, at 2.9%. Nordic countries had some of the smallest gender gaps in 2006. In 2015, they remain the countries with some of the smallest gender gaps in the world—but their progress towards parity has been uneven. Finland and Norway, the countries with the second and third smallest gender gaps in 2006, have closed them by 5% over the past 10 years, making steady progress. In 2006, Sweden had the narrowest gender gap in the world. However over the past 10 years, it has closed it by a mere 1%. Its neighbour Iceland has overtaken it by making 10% progress to top the rankings. As it currently has the narrowest gender gap in the world—having closed it by 88%—if Iceland were to make similar progress in the next 10 years, it will be in a position to close its gender gap fully. Progress has emerged from both high- and low-ranked countries. For example, Iceland’s strong progress is matched by that of Nicaragua, Bolivia, and Nepal, who are among the countries that have made the most progress on reducing their gender gap in the past 10 years (by 10–12%). Nicaragua leads the way, having closed its political gender gap by 32% and its economic gender gap by 16%. Bolivia has made similar progress. Nepal started its transition from having the 5th largest gap (55% overall) and has now closed its political gender gap by 13% and its education gender gap by 18%. While Yemen has remained the lowest-ranked country throughout the 10 years, it has made progress—from having closed a mere 46% of its gender gap in 2006 to closing the gap by a further 2.5% today. In 2006, Chad and Saudi Arabia had the second and third widest gender gaps in the world. The past 10 years has seen both countries make strong progress by narrowing their gender gaps by 5.5% and 8%, respectively. In fact, Saudi Arabia has progressed past Pakistan, Chad, Iran, Jordan, Morocco and Mali. Sri Lanka, Jordan, Mali, the Slovak Republic and Croatia form the 6% of countries that have widened their gender gaps over the past 10 years. In Jordan and Sri Lanka the gap has widened by more than 1%. In other countries progress has stalled. For example, Iran’s gender gap stands at 58% today, just as it did in 2006; and Pakistan’s slow progress in gender parity has seen it fall behind Saudi Arabia and Chad. It now has the second widest gap of the 109 countries we have traced over the past 10 years. Both the starting points and progress look different across the four subindexes of the Index. Gender gaps are widest in Economic Participation and Opportunity and Political Empowerment, while the average gap to parity is a mere 2% in Health and Survival and 5% in Educational Attainment. However, progress has been most pronounced on Political Empowerment, with the world closing this by 9% in the last 10 years. On the other hand, progress in the second widest gap—Economic Participation and Opportunity has been slower and more turbulent. When it comes to women’s economic participation, the world today is back to where it was in 2010 after a peak at 60% in 2013. Across the world’s regions, the range of the economic gender gap is especially wide compared with the political, economic and educational gender gaps. The regional average varies by as much as 40%. North America, as well as Latin America and the Caribbean have improved economic parity the most. Over the past 10 years, the economic gender gap has been decreased by 7%, standing at 82% today. Europe and Central Asia and Sub-Saharan Africa are not far behind, having shrunk the gap by roughly 6%, over the past 10 years, and by 62–63% overall. Women’s economic participation is least improved in the Middle East and North Africa—where the economic gap has been reduced by 1%. The Asia and the Pacific region has also made little progress in closing its gender gap on this subindex, with a similar 1% increase. To reach gender parity in economic participation in the future, Asia and the Pacific would need to close a 47% gap and the Middle East and North Africa, 59%. 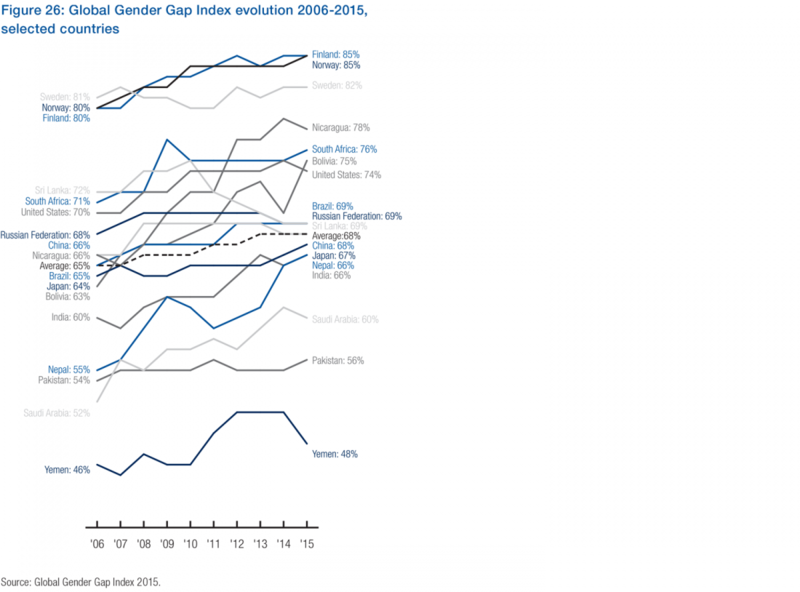 Figure 22 displays the relative positions of regions according to their economic gender gap between 2006 and 2015. Across the 109 counties we have covered since 2009, 87% have narrowed their economic gender gaps. Bahrain, Luxemburg and Guatemala have closed the economic gender parity gap fastest. Bahrain now has 26% more female professional and technical workers, and 14% more female legislators, senior officials and managers. Iran and Saudi Arabia have also narrowed their gender gaps and are no longer in the cohort of countries with the three widest economic gender gaps—where they were in 2006. On the other hand, Tanzania, Jordan, Morocco and Mali have significantly widened their economic gender gaps—Tanzania by as much as 10% and Mali by as much as 6%. In Jordan, the female labour force participation rate has decreased by 12%, while Mali has seen an even larger decrease of 23%. The change in labour force participation has decreased alongside wage equality for similar work and parity in the gender breakdown of legislators, senior officials and managers. In the case of Tanzania, the marked decline has emerged from adjustments to the data for the Legislators, senior officials and managers indicator, highlighting the need for improved data collection and comparability in international statistics. On the Labour force participation of women indicator across the past 10 years, 81% of countries have made progress. Nepal has had the largest increase of female labour force participation. In 2006 it had closed 64% of the gender gap on this indicator; in the past 10 years it has improved by 30% (from 0.637 to 0.935). Other countries that have shown particularly strong growth include Botswana, Nigeria, Spain, Nicaragua, South Africa and Lesotho. Guatemala and Bahrain have both made strong progress relative to their starting points (16% and 13% respectively). On the other end of the scale, Iran has increased its labour force participation gender gap the most—by about 30% in the past 10 years (0.520 to 0.229). Similarly, Mali, Argentina and Mauritania have increased their labour force participation gender gap by more than 20%. Of the three, Mali used to perform particularly well in 2006, when it had closed 86% of the gender gap on that indicator. Among the BRICS, South Africa has improved its labour force participation gap by 18%, Japan by 11%, while India has widened its gap by 7%. When it comes to women’s ability to rise to positions of authority, over the past 10 years, 68% of countries have made progress towards a more equal cohort of legislators, senior officials and mangers. During this period, Colombia and Ghana have both reached parity, with scores of 0.613 and 0.515, respectively. Ghana, in particular, has made a significant jump of 50%. In 2006, France had a notably low level (0.075) of female legislators, senior officials and managers. Yet it has made significant improvements—rising by 41%. On skilled roles—specifically professional and technical workers—50% of countries have reached parity. Of that cohort, 36% were already at parity in 2006. Among those who have recently reached parity are Bulgaria—spanning a gap of 48%—as well as the Dominican Republic and Guatemala. France is nearing parity, from an initial score in 2006 of 0.667. In 2006, both Nepal and Bahrain had only closed 22–24% of their gender gaps for professional and technical workers. Ten years later, they have both improved past the 42% mark and are on the way to closing half of the gap. A number of countries are significantly overshooting parity, with around 12% of the 109 having a ratio higher than 1.5 women /men. These include Lithuania, Moldova, Venezuela, Latvia, the Russian Federation, Ukraine, Estonia, Mongolia and Georgia. On education, to date 20% of countries have closed their education gender gaps, and 39% have narrowed the gap down to 1%. In 2006 only 14% had fully closed their gender gaps on education. Europe and Central Asia, North America, and Latin America and the Caribbean are a fraction of a percent away from full parity (having grown by 0.7%, 1.5% and 1.3% respectively). The Middle East and North Africa, and Asia and the Pacific have closed the gap by 5% and are now 6% and 5% away from parity respectively. Sub-Saharan Africa has the most persistent gap, which has closed by a mere 2%, and it is 15% away from parity. Figure 23 displays the regions relative positions in the Educational Attainment subindex. Chad has closed 59% of its education gender gap, 12% over the past year by making strong improvements in literacy and secondary education. Burkina Faso and Nepal have closed their education gender gaps by 18–19% over the past 10 years. 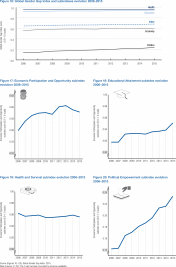 Nepal has seen strong improvements in its tertiary education rates. Yemen, Pakistan and Saudi Arabia have made smaller, yet strong improvements in their own education gaps of 10–12%. This brings Saudi Arabia on the verge of parity—it has currently closed 99% of its education gender gap. On the other end of the spectrum, Malaysia, Albania, the Dominican Republic and Nigeria have all increased their education gender gaps by more than 10%. The Dominican Republic has reversed out of parity while Albania has seen a decrease in the degree to which women take part in tertiary education, a gap increase of 26%. In Malaysia, the decrease is across both secondary and tertiary education. 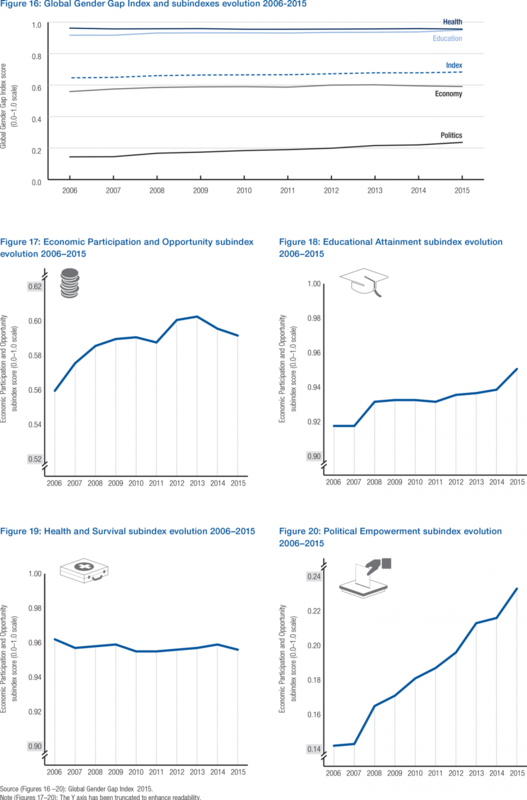 Figure 28 displays selected countries trajectories between 2006 and 2015 on the Educational Attainment subindex. Among the 109 countries we have covered for the past 10 years, 30% of countries have closed the Health and Survival Gap to date. In 2006, this figure stood at only 18% of countries. In the last 10 years, the health gap has increased by a small fraction: while in 2006 the health gap was closed by 96.2%, today it is closed by 95.6%. The Asia and Pacific region has seen a gender gap increase of 1%—unsurprising, since large and populous economies such as India and China are the worst performers in this area. North America and the Middle East have both stepped back from near parity by 0.5% and 0.3% respective. North America’s widening health gap is in contrast to the region with which it used to share the top spot in health in 2006, Latin America and the Caribbean. Latin America and the Caribbean currently leads the Health and Survival subindex, and has kept its general position at near parity, having closed 98% of its health and survival gap. Sub-Saharan Africa and Europe and Central Asia are the only regions that have seen a decrease in their gender gap. 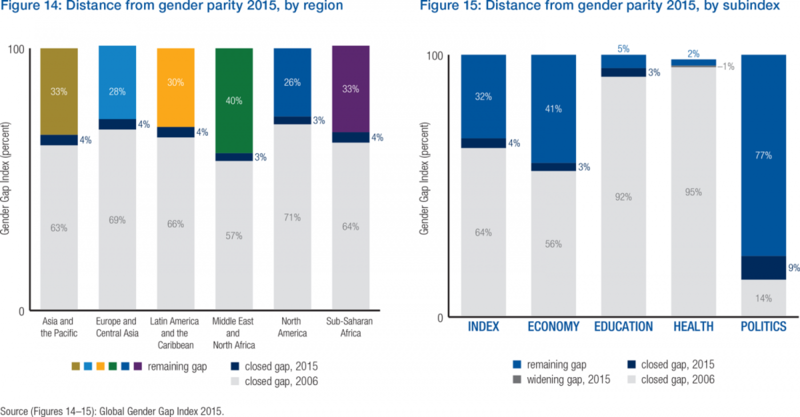 Sub-Saharan Africa’s gap decrease has seen it overtake Middle East and North Africa in this aspect of gender parity. 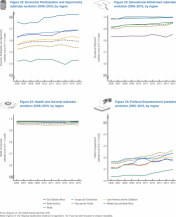 Figure 24 displays the Health and Survival subindex evolution by region. The countries that improved the most in health are Nepal, Pakistan, Bangladesh and Botswana (starting from a score of roughly 0.95, or a 3% gap from parity). The countries that have declined the furthest on the Health and Survival subindex are India, China and Albania. Since 2006, India and China have widened their gender gaps by around 2% and, today, the countries with the largest gender gaps in this subindex are, in fact, China, India and Albania (6%, 4%, 3% away from parity, respectively). 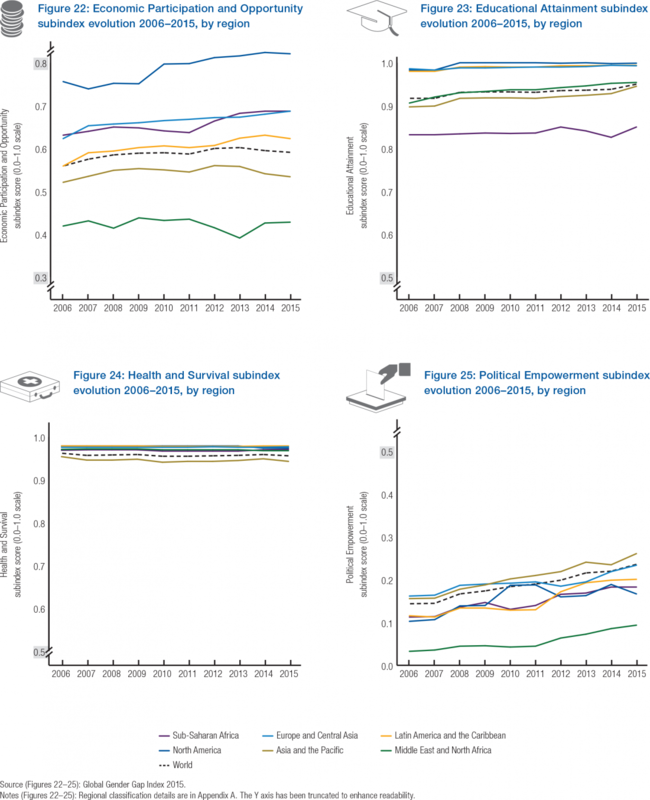 Figure 29 displays selected countries’ progress towards gender parity on the Health and Survival subindex. On average, the political participation gap has closed the fastest in the past 10 years—by approximately 9% (0.144 to 0.236). However, this gap is still wide across the world. Asia and the Pacific has a political gender gap that is narrower than the world average, and has closed by over 10% in the last 10 years, but it still has to close 74% of the gap to reach parity. Until 2009, Europe and Central Asia was growing at a similar rate; however, the region has fallen behind the curve and currently performs below Asia and the Pacific. Similarly, North America lags behind Latin America and Sub-Saharan Africa for women’s political participation after a brief increase in 2010–2011. The momentary increase did not leave lasting change, leaving Latin America and Sub-Saharan Africa to pull significantly into the lead. Latin America has experienced healthy progress, closing 9% of its political gender gap over 10 years; it now has, on average, closed 20% of its gender gap. On the other end of the spectrum, the Middle East and North Africa has the widest remaining political gap, having barely closed 9% of its gender gap. However, countries across the Middle East and North Africa have collectively closed 6% of the political gender gap since 2006, the second-largest progress among all regions. 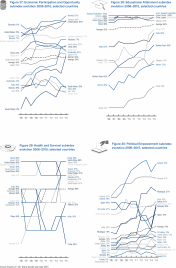 Figure 25 shows the Political Empowerment subindex evolution by region. While the overall trajectory on the Political Empowerment subindex has been positive, it has the most volatility across countries as political roles and systems are subject to variation. Among the most improved countries are Bolivia, Slovenia, Nicaragua, Iceland and France in the top five, with Italy and Switzerland close behind. They have closed between 20 and 35% of their gender gaps. Iceland, Finland and Norway are both highly placed and have made strong improvement. Slovenia has made the largest increase from the lowest base. In 2006, it had closed 15% of its political gender gap; today the figure stands at 38%. It is followed by France, which had closed 10% and now has gone on to close 37%. Iceland significantly outperforms all other countries. Iceland had closed 46% in 2006, and in the past 10 years it has come to close 72%. Bolivia’s improvement stems from the larger participation of women in parliament, where the country has now reached parity—up from 34% in the past—but is offset by its ministerial score halving since 2012. Only two countries have gender equality in ministerial roles currently, the same as in 2006. France’s recent improvement is largely due to a parity cabinet, similar to its rise in 2008 and 2009. In 2006, Spain had achieved parity on the Women in ministerial positions indicator, as had Sweden. While Sweden has sustained this position, Spain’s ministerial parity has dropped sharply. It currently stands 56% away from parity. Nicaragua’s progress across this indicator has been stable thus far. Ten years ago, 62% of countries had never had a female head of state, today that figure has dropped to 50%. Australia, Brazil, Costa Rica, Denmark, Kyrgyz Republic, Malawi, Mali, Mauritius, Moldova, Slovak Republic, Slovenia, Thailand, and Trinidad and Tobago have all elected a female head of state for the first time since 2006. Countries’ performance on the Political Empowerment subindex is closely related to the presence of political quotas. For example, Nicaragua, Bolivia and France have all put into place voluntary political quotas. 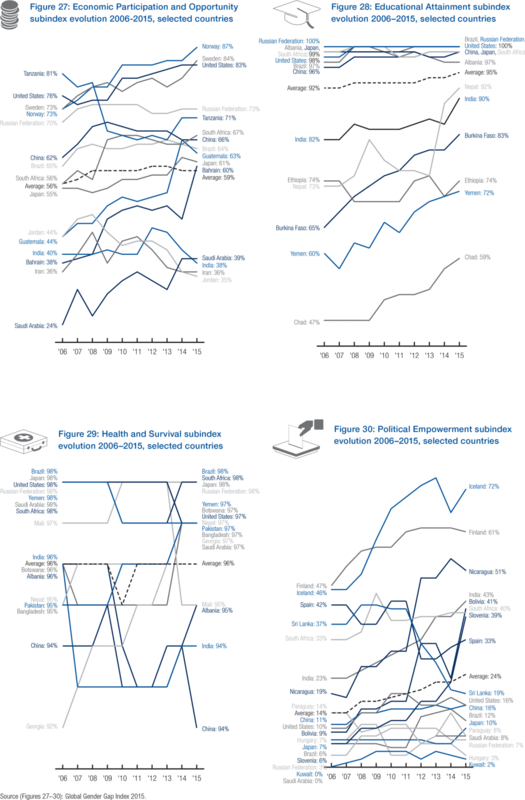 Figure 30 displays the evolution of selected countries within the Political Empowerment subindex.